Last week I brought you my recipe and step-by-step instructions for making Korean Kimchi. 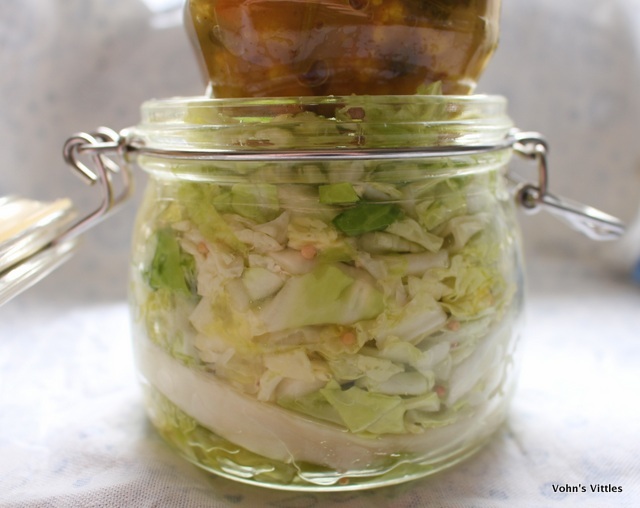 Today is another lacto-fermented cabbage dish, German Sauerkraut. This is made in essentially the same way as Kimchi but without all the spice. 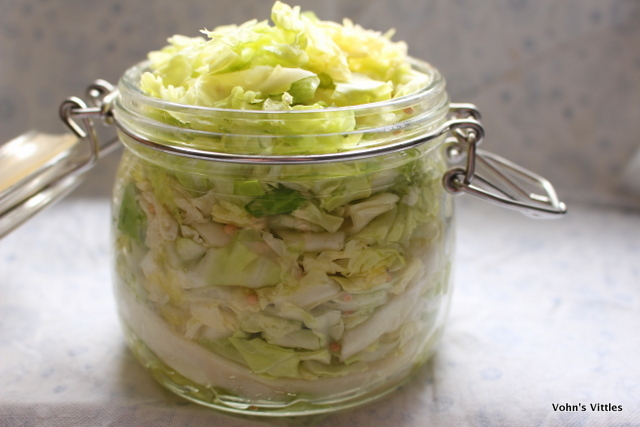 Fermented Sauerkraut is softer and sourer than raw cabbage but still retains a crunch. I often add a handful to my lunch plate as is it great for keeping one’s gut healthy with good bacteria! I have also found that it gradually adjusts my palate and I begin craving more sour foods and less sweet foods, so it is perfect for helping you to stick to a diet or healthy eating plan. If you struggle with sour foods you might have tried Sauerkraut and not liked it. I urge you to make it yourself as you can stop the fermenting process whenever you like, so it is not so sour. 1) Start by shredding the cabbage, discarding the core. Place in a bowl and mix in the sea-salt. Leave for about an hour until the cabbage starts to exude brine. 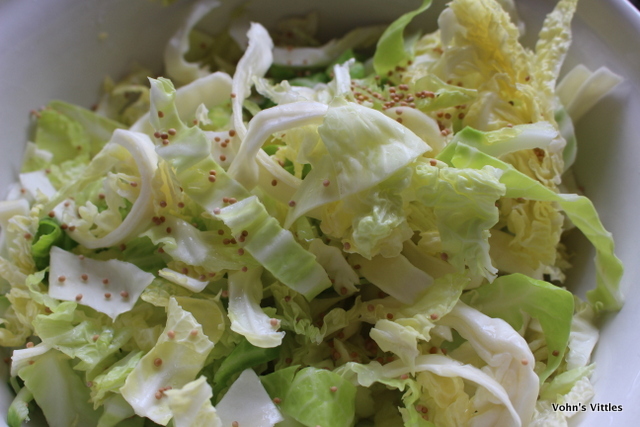 When I am making a big batch, using several cabbages at once, I simply do all this in the kitchen sink! 2) Mix in your spice, traditionally caraway seeds or juniper berries but I am using mustard seeds. 3) Pack the Sauerkraut tightly into jars. The easiest way to do this is one handful at a time, pressing it firmly down before adding the next handful. You will be amazed how much can fit in one jar! 4) Pace a weight on top, or use a makeshift weight like I do, which is a glass jar or a tin can wrapped in cling film. The important thing is that it is heavy enough to press down the Sauerkraut so it is all covered in brine but still allows air in. 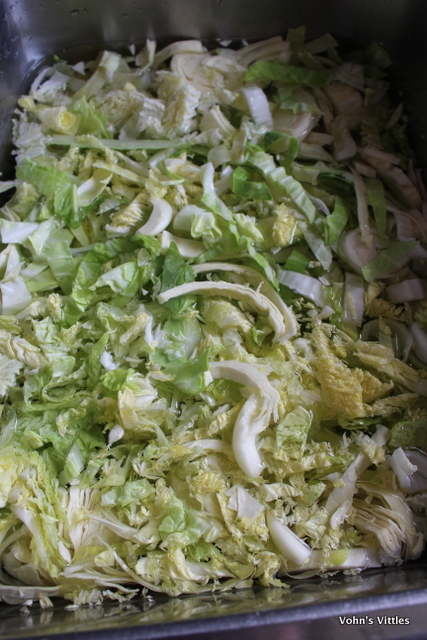 If the brine doesn’t quite cover the cabbage, add water until it does. It is also best to place the whole thing in a dish to catch any juices which may overflow. 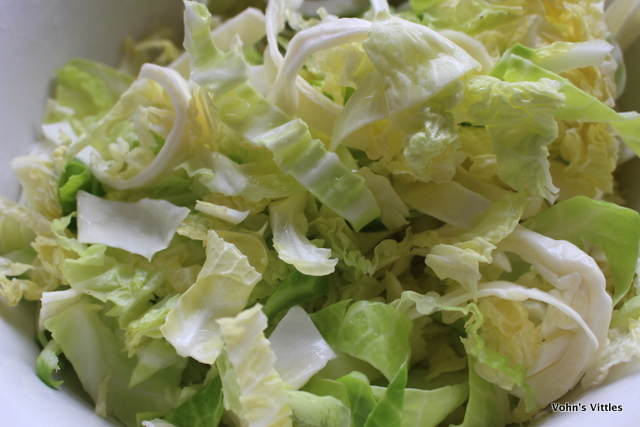 You will need to tend to your Sauerkraut for a few seconds each day – press down on the weight to release the fermentation gases that build up and ensure the top of the cabbage is still covered in brine. After a few days, start tasting once a day as the flavour changes as it ferments. Some people like a long ferment, some short – I like to leave mine for about a week. Once the flavour has developed to your personal taste, remove the weight, close the lid and store in the refrigerator. Sauerkraut can keep for several months and even years! P.S. I am entering this into Chris’s Foodie World Cup bloggers challenge, as Germany are playing today (30th June 2014).